The Honda Pilot SUV is a eight-seater that means real big SUV business, and its got the moxie to deliver! 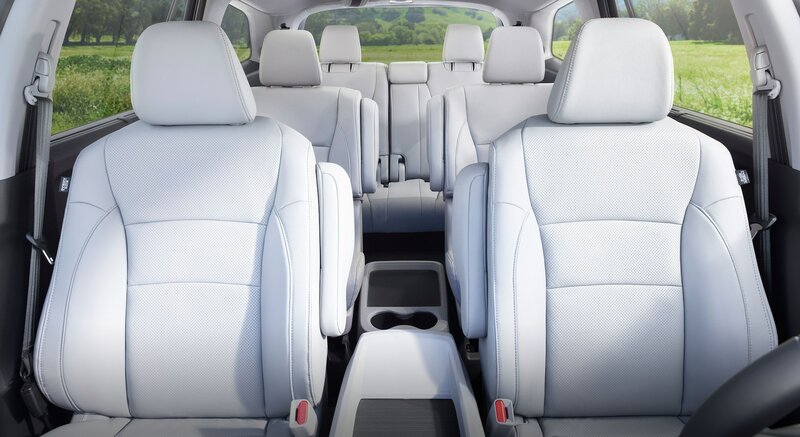 You will certainly enjoy this SUV if you travel a lot with family and they will appreciate that you thought of their comfort and safety as well. New for 2017, Apple CarPlay and Android Auto compatibility become available to Pilots with the 8-inch touchscreen (EX and above). Let’s check this capable behemoth out a bit more below. A direct-injected 3.5-liter V6 engine has 280 horsepower @ 6,000 rpm and 262 lb-ft of torque @ 4,700 rpm. This engine features variable cylinder management and is paired with a six-speed automatic transmission on the LX, EX, and EX-L models, or a nine-speed auto on the Touring and Elite models. All models offer AWD, and Honda’s Intelligent Traction Management system is standard on Elite models. 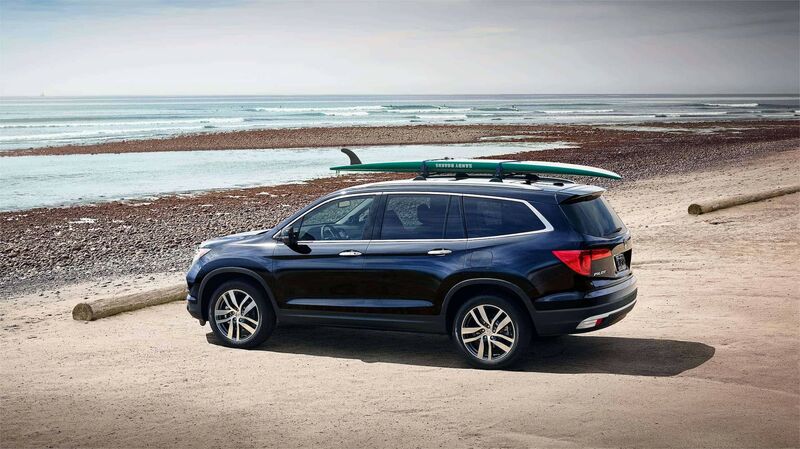 The 2017 Honda Pilot presents itself in LX, EX, EX-L, Touring and the Elite model levels. All of these seat eight people, besides the Elite, which has hip, second-row captain’s chairs instead (seats 7). The Pilot is a triple-row crossover SUV that works well for a travelling family. Standard features are expansive, including cruise control, a tilt-and-telescoping steering wheel, 18-inch alloy wheels, AC, and a 60/40-split folding third-row seat. Electronic functions inside are a seven-speaker sound system, a rearview camera, a 5-inch central display screen, Bluetooth phone and audio connectivity, an aux audio jack and a USB port. The EX model adds automatic headlights, remote engine start, the Honda LaneWatch blind-spot camera, foglights, LED running lights, heated mirrors, dynamic guidelines for the rearview camera, Apple CarPlay and Android Auto compatibility, and Pandora internet radio control. Going to the EX-L adds a power tailgate, a leather-wrapped steering wheel, and a sunroof. The Touring model adopts all of the EX-L’s standard and available items plus 20-inch wheels, automatic engine stop-start, roof rails, front/rear parking sensors, driver-seat memory settings, and more! The premium-oriented Elite trim adds a panoramic sunroof, LED headlights, blind-spot monitoring with rear cross-traffic alert (replaces LaneWatch), automatic high-beam headlight control, automatic windshield wipers, and a lot more! Is there a sunroof available? Yes! Passengers in the second and third rows can enjoy a panoramic sunroof if picked as an option. Honda LaneWatch is standard on the EX, EX-L and Touring models while auto high-beam headlights and blind spot monitoring with cross traffic monitoring comes standard on the Elite model. Standard safety features include brake assist, multi-angle rearview camera with guidelines, front, side, and curtain airbags, and ABS brakes, while available points of safety contain Honda Sensing that adds road departure mitigation lane keep assist, collision mitigation braking, and adaptive cruise control. For supplemental safety, the EX and EX-L trim models both can have the Honda Sensing package. That package put in adaptive cruise control, a road departure intervention system, a forward collision warning system, forward collision mitigation with automatic braking, and lane departure warning and intervention systems.